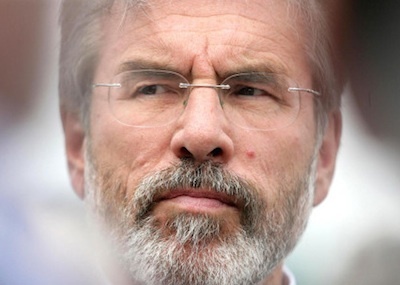 The PSNI police in the north of Ireland say thay have arrested Sinn Fein leader Gerry Adams after he agreed to speak to them about the circumstances of the abduction and execution of British state informer Jean McConville in 1972. 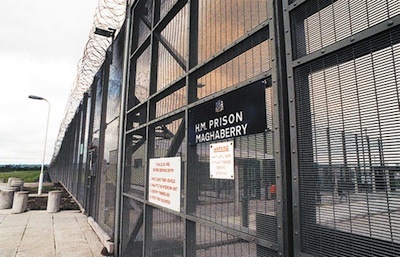 Republican prisoners in Maghaberry jail were assaulted on Thursday night by scores of prison warders in a continuing dispute over controlled movement and forced strip searching, it has been reported. 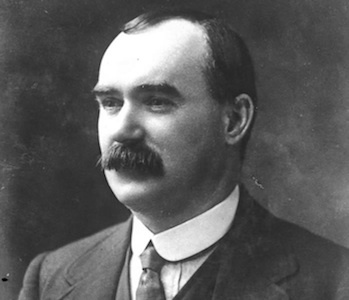 Fianna Fail and Sinn Fein have reacted strongly to the Dublin government’s plans to reinvent the 1916 Easter Rising as an Anglo-Irish ‘celebration’ including the British government and leading members of the British royal family. 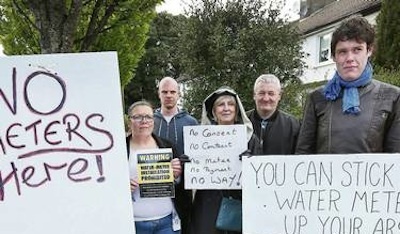 Water meter contractors have been blockaded from installing meters in Cork and Dublin in a spontaneous campaign by two communities against the new tax on householders. 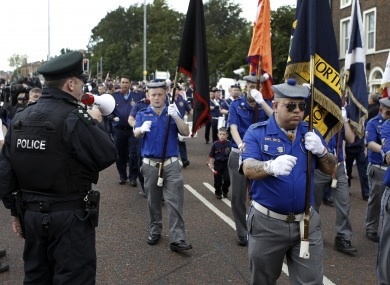 The first controversial sectarian parade of the season passed off without incident on Easter Monday, but residents in north Belfast have already issued stark warnings over the determinations of a newly-appointed Parades Commission. 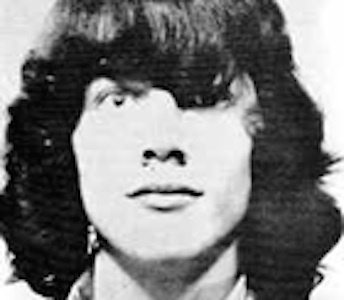 A fresh inquest has been ordered into the British state killing of a teenager in west Belfast in 1975. 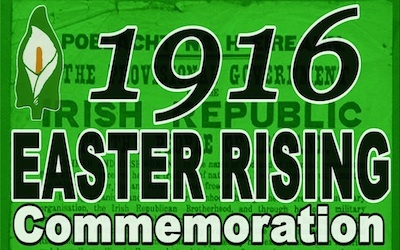 A round up of the statements and orations delivered this week to mark the anniversary of the Easter Rising in 1916. 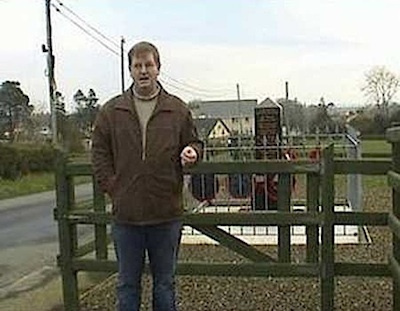 Dave Kenny’s family is steeped in Easter Rising history. 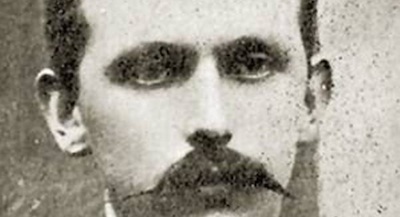 Here he recalls finding a letter from the Eamonn Ceannt’s son, revealing how he lived his life in his father’s shadow. 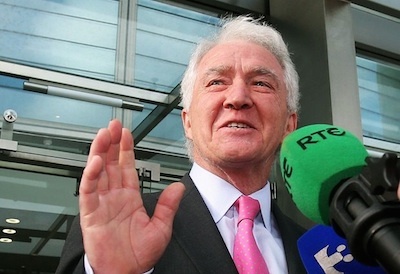 The disgraced chairman of Anglo Irish Bank has been cleared this week of hatching a highly illegal loans-for-shares plot months before the bank’s collapse. 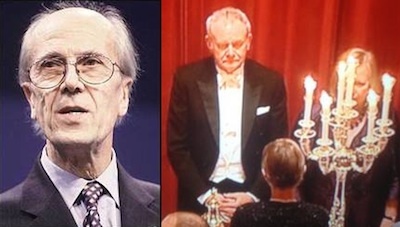 Two of his colleagues were found guilty. 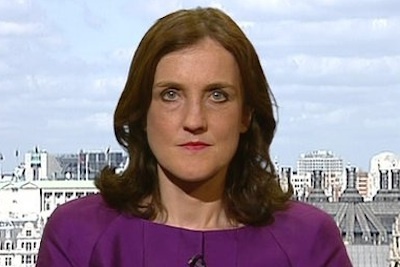 Theresa Villiers, who implements British Direct Rule in Ireland, has set out a sharply pro-unionist agenda for her government in dealing with the past conflict in the Six Counties. 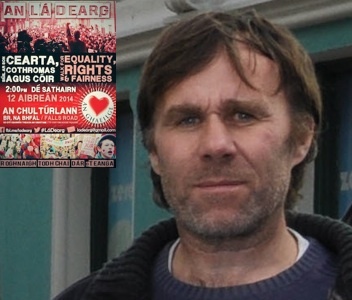 A man expelled from the Continuity IRA for criminal activity was shot dead yesterday [Friday] at a diesel depot he operated. 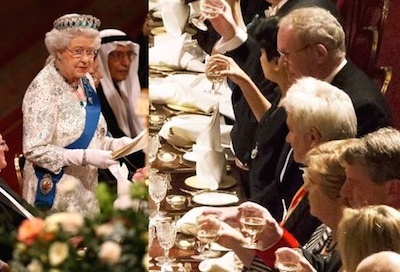 Sinn Fein has been urged to stay away from Easter commemorations after Martin McGuinness attended a royal banquet and toasted England’s queen, Elizabeth Windsor. 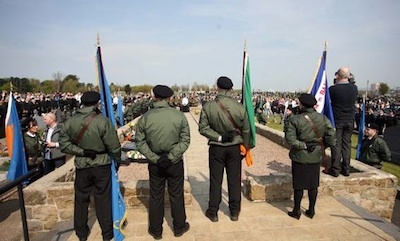 Colour party uniforms belonging to Republican Sinn Fein due to be used during an annual easter commemoration in Lurgan this Saturday have been seized during police raids in Craigavon. 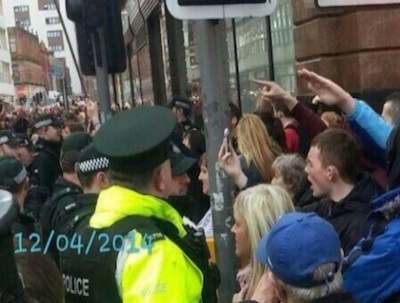 Loyalists greeted members of an Irish language rally last weekend with Nazi salutes. Dates, times and places are subject to change - please contact your local organisers to confirm. Please also contact us regarding any errors or omissions. 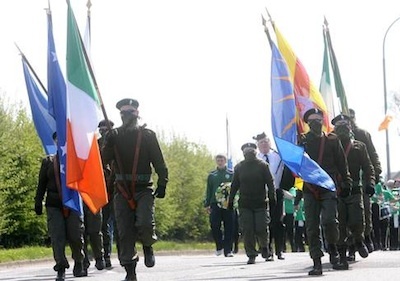 The Dublin and London governments have signalled a major effort to combat nationalist sentiment in the run-up to the anniversary of the 1916 Rising following this week’s heavily promoted state visit to London by 26-County President Michael D Higgins. 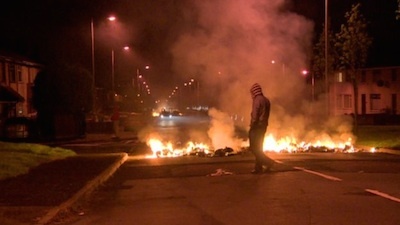 The unionist paramilitary UDA are understood to be planning riots this weekend in the town of Carrickfergus, in County Antrim following serious disturbances last night. 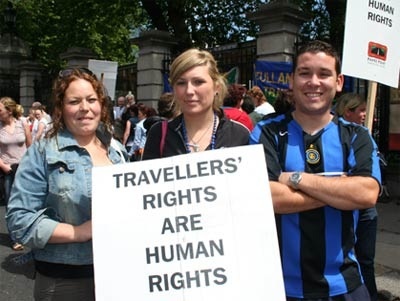 Recent protests over discrimination against Irish language speakers in the north of Ireland are to reach a climax on Saturday with a major demonstration through Belfast city centre. 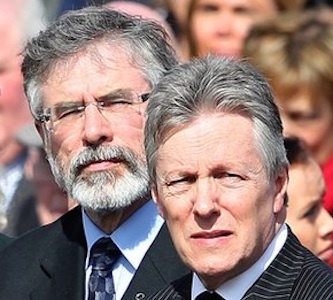 Well-known loyalist Willie Frazer attempted to personally “arrest” a republican he alleged was ‘on the run’ from a conflict-related prosecution this week. 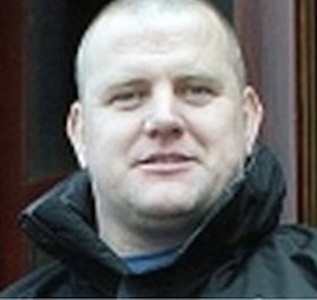 The victims’ campaigner tried moved towards mourners at a funeral in County Down, but was blocked by a line of PSNI police. 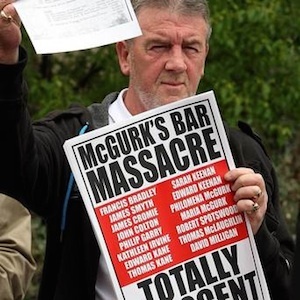 Families of those killed in the McGurk’s Bar massacre have succeeded in forcing the British authorities to release an unedited report into the bombing, it has been confirmed. 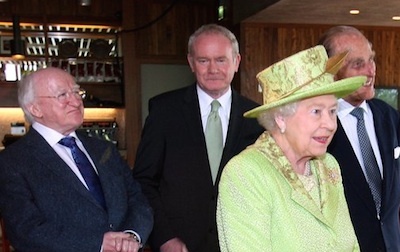 Relations between Britain and Ireland have now entered the realm of the surreal. 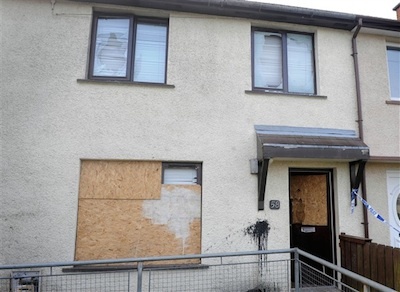 It is obviously a matter for Sinn Fein who they meet but from the outside this looks like another ‘leadership initiative’ which has nothing to do with improving the material conditions of the working class or advancing towards the Republic. 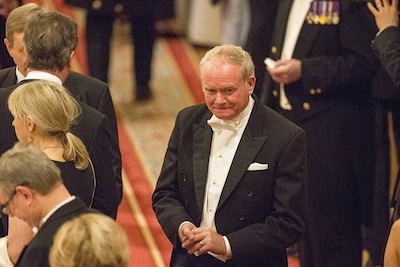 Sinn Fein’s Martin McGuinness this evening stood for the British national anthem and toasted the “health and happiness” of the English queen in the most symbolic gesture yet of his party’s support for the status quo in the north of Ireland. 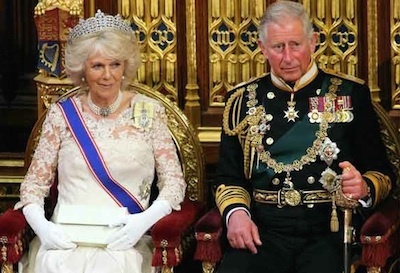 A Chairde, if you have not already done so, please consider taking out an annual subscription. 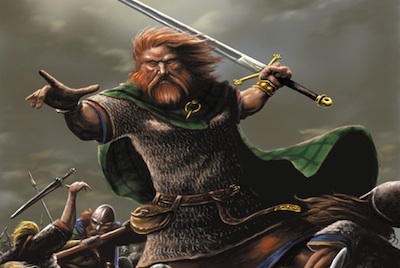 We need it to help keep us going. 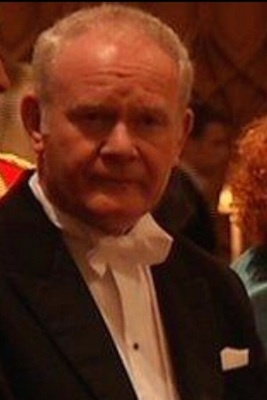 Sinn Fein has confirmed reports that Martin McGuinness is to visit Windsor Castle to attend a royal banquet with the English queen this week. 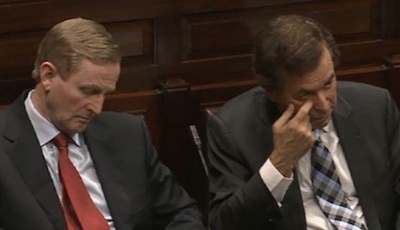 Continuing public anger over illegality, corruption and delinquency in the 26 County justice system has seen support for the Dublin coalition government slide to its lowest levels for several years. 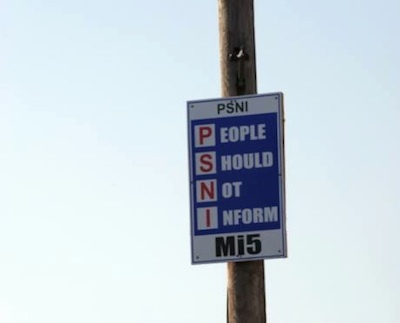 A surge in activity by republican militants in the Strabane area of county Tyrone has seen the PSNI police twice targeted by explosive devices and a nearby village declared a ‘no go’ area for the force. 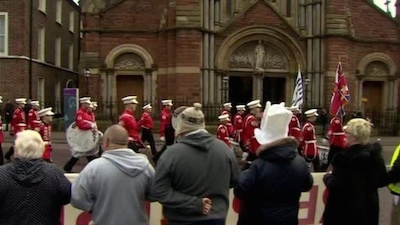 Seventeen members of a loyalist flute band have been cleared of defying a ban on them marching past St Patrick’s Church in Belfast in the latest sign that the courts do not intend to hold loyalists to account for parades infractions. 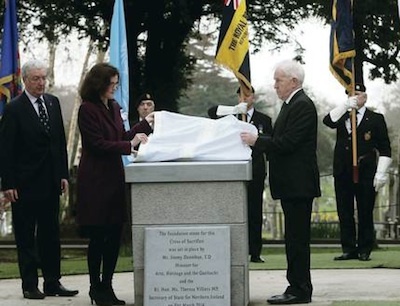 British Direct Ruler Theresa Villiers was accused of a “final, carefully calculated insult” to Ireland’s republican martyrs in a ceremony of Glasnevin Cemetery in Dublin last Monday, March 31st. 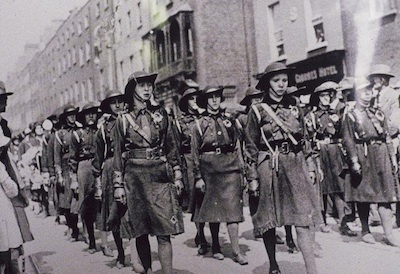 The revolutionary women’s movement, Cumann na mBan, was set up 100 years ago this week. 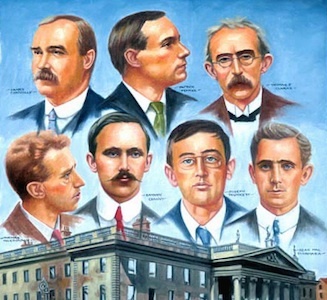 It maintained the struggle for independence following the Easter Rising and in 1921 became the first organisation to reject the treaty which partitioned Ireland. 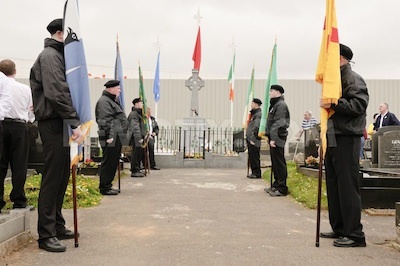 A look at their stand for equality and unity. 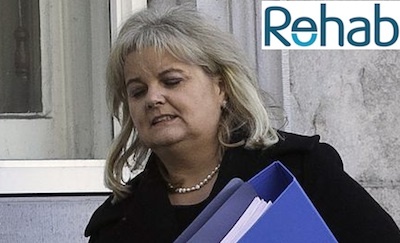 Angela Kerins has finally resigned as the CEO of Rehab in a scandal over the salaries and bonuses paid to her and other senior executives of the charity for the disabled, but those left behind must pick up the pieces.